The Lego Ninjago Movie review: "There's no denying the pieces don't quite click together"
Tots will enjoy, but there’s no denying the pieces don’t quite click together. Best giant moggy since The Goodies, mind. It’s both amusing and ironic that a key scene in The Lego Ninjago Movie, the third film in as many years to showcase Denmark’s expansive line in children’s construction toys, should take place in ‘The Temple of Fragile Foundations’. Because this latest attempt to cash in on the minifigures, interlocking bricks and other plastic paraphernalia behind this global success story is indeed on shaky ground, with neither the novelty of 2014’s The Lego Movie or the familiarity factor of this year’s The Lego Batman Movie to save it from tottering. That’s not to say there isn’t much to enjoy in this tale of a put-upon high-schooler (voiced by Dave Franco) whose ninja alter ego helps him deal with the ignominy of being the son of his city’s most persistent assailant (volcano-owning baddie Garmadon, voiced by Justin Theroux with more than a suggestion of Will Arnett’s Dark Knight). 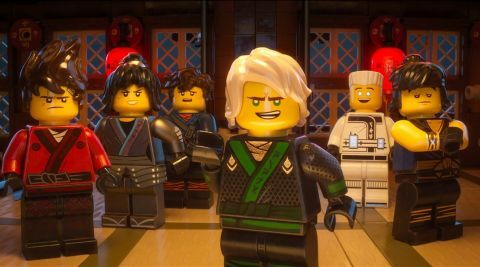 Having established the ‘Ninjago’ universe, however – a pan-Asian chop suey of Chinese, Japanese and Korean influences, lent semi-legitimacy by the presence of Jackie Chan in both a Gremlins-style live-action prologue and as the voice of beard-stroking sensei Master Wu – the film quickly runs out of both ideas and steam, despite having three directors and no fewer than six credited scriptwriters calling its shots. TLNM opens strongly with an all-out attack on Ninjago City that’s fended off by Franco’s Lloyd and his five ninja buddies, each of whom has the power of a different element (water, fire, lightning etc) to draw on in a clinch. When Lloyd’s use of an “ultimate weapon” results in a new menace coming to town, however, he’s forced to team up with Garmadon to find a solution – at which point the film ceases being a tongue-in-cheek parody of Tokyo-stomping monster movies and becomes a sappy story of father-son reconciliation, complete with sudsy flashbacks and plenty of hugs and learning. Imagine the Buzz-Zurg subplot from Toy Story 2 (“Good throw, son!”) drawn out to feature length and you’ve basically got the idea. Yet there’s no escaping the fact that TLNM isn’t as funny, engaging or conceptually coherent as its predecessors, resulting in a product you’d be tempted to put back in the box and return to the shop once the initial thrill has waned.